A well-celebrated festival for brothers, Bhai Dooj holds the magic of bonding the brothers and sisters on this very eminent day in order to celebrate it in utmost vigor. While brothers make sure to get their adorable sisters a gift of the year, sisters can too put their best foot forward with this endless variety that caters to pamper their brothers in a unique way. This is indeed one of the best quotes on siblings that would never go wrong on Bhai Dooj to celebrate the strong bond you share with your brother. As you grow older you realize that no matter how many fights you have had with your brother, he will always be there to stand by your side, cheer you up in your sorrows and be your superhero during the tough times. Right? So, on the auspicious occasion of Bhai Dooj, don’t miss the opportunity to thank your brother for always being with you. The bond of love, care, and affection that you share with your brother cannot be expressed in words. Right? But, you can surely present him meaningful Bhai Dooj gift to make him feel special. So, if you are looking for some amazing and unique Bhai Dooj gift ideas for your brother then, you are in the right place. We, at FlowerAura, offer you a delightful range of Bhai Dooj gifts for Brother that are sure to convey your emotions in the most amazing manner. We have an exclusive collection of Bhai Dooj gifts for brother online which includes mugs, cushions, greetings, personalised keychains, flowers, chocolates, cakes, grooming kits, wallets, cologne, and many more. The best thing is that now you don’t have to go outside to buy a Bhaubeej gift for brother as you can order one online from us comfortably seated anywhere. All you need to do is to visit FlowerAura.com, select a Bhai Phota gift for Brother, add your address details, and place your order. Your ordered Bhai Phota gifts for brother will be delivered to your doorstep by our delivery team via an express delivery service. So, go ahead to show your adoration for your doting and beloved brother with our wide range of alluring and attractive Bhai Dooj 2018 gifts for brother. This joyous festival of Bhai Dooj strengthens the bond between a brother in a sister. So, if you want to build your bond stronger with your brother, don’t forget to surprise him with the best Bhai Dooj gift from FlowerAura.We have a wide variety of mouth-watering sweets like Kaju Katli, Rasagulla, gulab jamun, Soan Papdi etc. You can also surprise your brother with our collection of scrumptious cakes like chocolate, vanilla, red velvet, butterscotch, strawberry, black forest, truffle which are available in amazing combos. Also because chocolates make the best gift for your brother on Bhaubeej, We offer you a delectable range of chocolates like Ferrero Rocher, Cadbury Temptations, Dairy Milk, Bournville, Cadbury celebrations and many more. Apart from sweets and personalized gifts, we also have amazing greeting cards that would help you to express your emotions towards your brother in a wonderful manner. So, log in to our website, check our amazing collection of Bhai Phota gifts, and grab the best gift for your brother on Bhai Dooj. 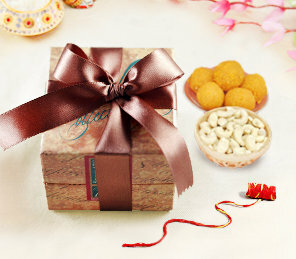 With the aid of our express delivery service, now you can also send Bhai Dooj gifts for brother In India. Yes, if your brother lives miles away from you and cannot make it to your place on the festival of Bhai Dooj then, don’t be upset because you can send him your tokens of love from our online gift portal. You can send a Bhai Dooj pooja thali or chocolates or sweets or other creative gifts and surprise him in a mesmerizing way. You can also send Bhai Dooj greetings to brother along with some delicious sweets or chocolates and celebrate the love for each other. With the aid of our same-day delivery service, you can send Bhaubeej gifts for brothers on the same day of your order placement. You can also surprise your beloved brother by sending gifts at midnight via our midnight delivery services. You can also avail our next day delivery option if you want are not available to receive your orders on the same day. And, guess what? With us, you can enjoy free shipping too. So, on this Bhai Dooj, gift your brother an everlasting memory that he will always cherish.